ROAD TO RUINS This past winter has been particulary hard on local roads. Marin was the hardest hit county in the state. This year's winter storms will cost California $866 million in road repairs, according to the latest estimates from the California Department of Transportation. That figure is a significant uptick from the $617 million in damaged assessed at the end of February, and doesn't include damage estimates from last weekend's wind-blown deluge which knocked out electricity throughout Marin County, along with the usual array of rockslides, washouts and local road flooding. The latest figures from Caltrans find Marin County easily at the top of the state list of storm-related 2016–17 damage with $91 million total spread over 17 different projects. The latest damage spreadsheets are a chorus of slip-outs and rockslides, road washouts and sinkholes, failed culverts and accelerated pavement failures. To date, Caltrans has identified 402 damage sites spread throughout the state's 58 counties. Napa County has 14 damage sites and Sonoma County has 17, according to Caltrans spreadsheets that detail the statewide damage. The respective price tags for repair are significantly lower than Marin's: Caltrans says it will cost $16.5 million to repair Napa's storm-damaged roads and $44 million to fix Sonoma's. That Marin County figure of $91 million translates into an eye-raising fact: roughly one in 10 dollars spent by Caltrans this spring and summer will be spent on one coastal county. And of the $91 million in damage to Marin roads, $78 million is accounted for in 13 damage sites spread along Highway 1. Several of the Sonoma County damage sites are also on Highway 1, and comprise about $10 million of the total $44 million damage estimate. Marin County also fields the third highest single-job estimate of the 402 damage sites identified by Caltrans in its latest damage report, a $17.4 million job to fix a slip-out on Highway 1 with a tie-back wall. Only Santa Clara and Monterey counties have single-ticket items that eclipse Marin's $17.4 million project. Caltrans pegged $30 million for a wall repair in Santa Clara county, and Monterey's got a pricey $28 million line item on the spreadsheet to replace the Pfeiffer Canyon Bridge, representing about half of that county's $60 million in damages. Clearly the Bay Area and North Coast took the biggest hit in the winter-spring storms of 2016 and 2017. The top counties after Marin are Santa Clara County, on the hook for $72 million; San Mateo, $63 million; Humboldt, $60 million; and Mendocino, $65 million. For comparison, Los Angeles County racked up $55 million in damage to its state roads. Caltrans estimates that when local costs are factored into their estimate, the total damage price tag is $1.27 billion. 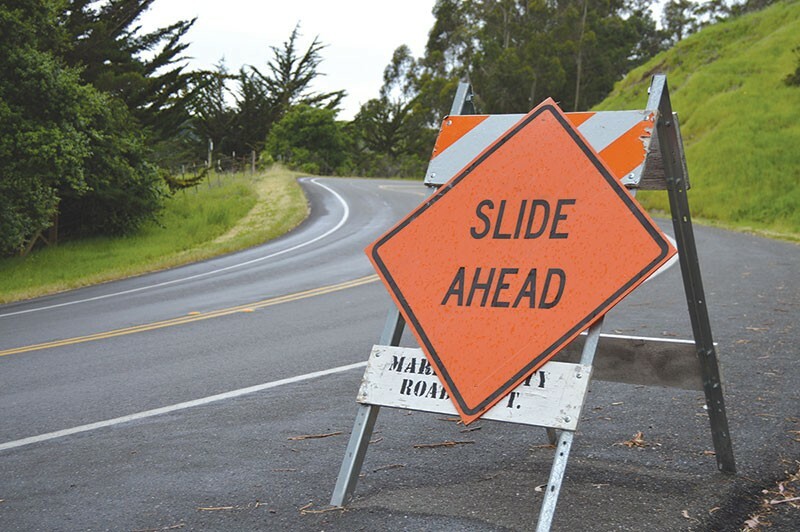 Recent reports estimated Marin County's road damage obligations at $10 million, out of the estimated $400 million that localities will pick up this year. The agency reports that it will spend $700 million on emergency projects this year, "leaving $170 million for permanent restoration projects." "This total will likely rise as we continue to assess damage and estimate repair and restoration costs," says Caltrans spokesman Mark Dinger via email. Help is on the way—generally speaking. Last week, the California Legislature passed SB 1, which will raise California's gasoline excise tax by 12 cents a gallon and enacts other auto-related fees in the state to fund a long-awaited, $55 billion road repair plan over 10 years. At the federal level, on April 4, Trump signed off on an unspecified commitment of Federal Emergency Management Agency dollars after Gov. Jerry Brown petitioned the administration for disaster relief earlier this year when the storm damage had eclipsed $500 million. Last week, the administration freed up additional but unspecified funds for Sonoma, Napa and Marin counties. The declaration of disaster will presumably allow counties to pay for a range of repairs brought on by the wicked winter of 2016–17. FEMA's eventual contribution to California's storm-damage repair remains an open question, especially given the erratic and contradictory messages coming from the White House. Trump has threatened to withhold FEMA funds to so-called sanctuary cities—there's a bill in Sacramento that would make the entire state a sanctuary state. Even as Trump pledges disaster relief to California, the administration's 2017 budget proposal calls for a $667 million cut in FEMA pre-disaster mitigation programs, according to North Bay U.S. representative Mike Thompson. Trump has also made lots of noise about a big infrastructure build-out, tantalizing talk for Democratic fence-sitters looking for a way to work with the president, even as his proposed budget eliminates the federal Department of Transportation, which Thompson recently noted in his critique of Trump's budget proposal, "provides almost $500 million in road projects." So what does all this mean for Sonoma County's notorious pothole problems? Probably not much. Voters in Sonoma turned back a proposed road-fix tax in 2015, a quarter-cent sales tax under Measure A. County officials have argued they need up to $1 billion to upgrade county roads—but the Sonoma County Supervisors could only scratch together $30 million in local road-fix dollars in 2015. The county website goes to pains to explain why there are so many potholes: "At about 2,700 lane miles, the road system of unincorporated Sonoma County is one of the most expansive in the greater Bay Area. Sonoma County also happens to be one of the more sparsely-populated municipalities in the region. This means that the amount of revenue generated for road repair in Sonoma County is below average for the amount of roadway. And for this reason, potholes are a common occurrence."